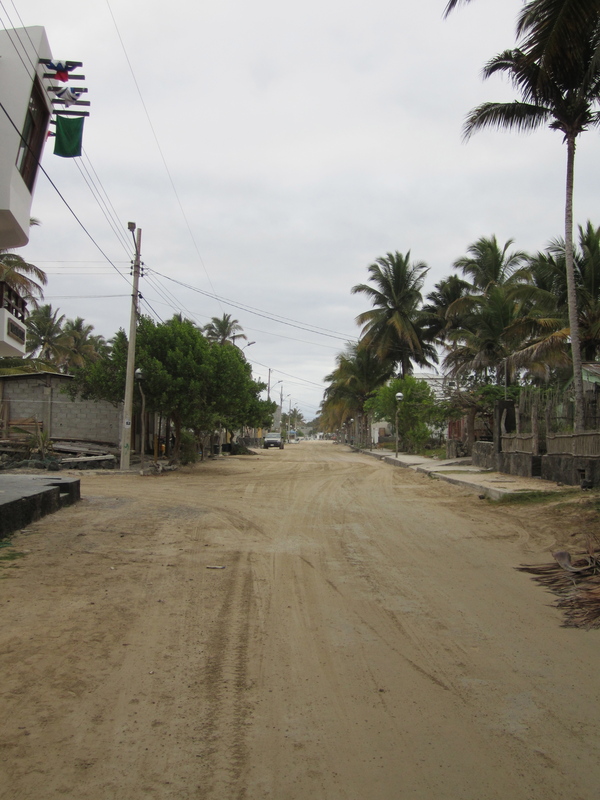 We arrived on the sand filled streets of Puerto Villamil, on Isabela island, after two ferry rides and a quick stop on the island of Santa Cruz. This island had a total different vibe and look than the other islands. It had much more of a laid back beach/surfer vibe, especially when compared to the relatively “busy” city in San Cristobal. I don't think we've ever been anywhere that had sand for streets before! Even with its relaxed vibe, the island still had many adventures to offer. On our first day, we rented bikes and rode up the coast in the quest of finding flamingos and a few other special animals. 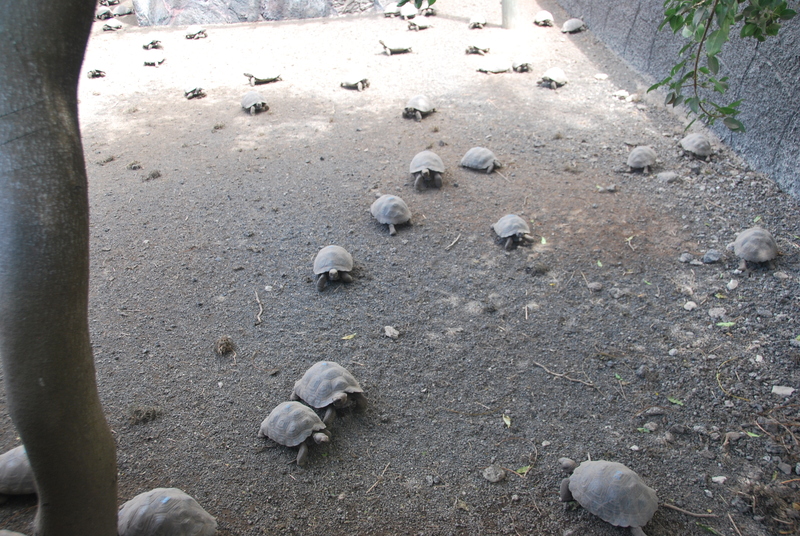 Our first stop was at a tortoise breeding center, similar to the one on San Cristobal. Young Giant Tortoise (super close up) - about 3 years old. 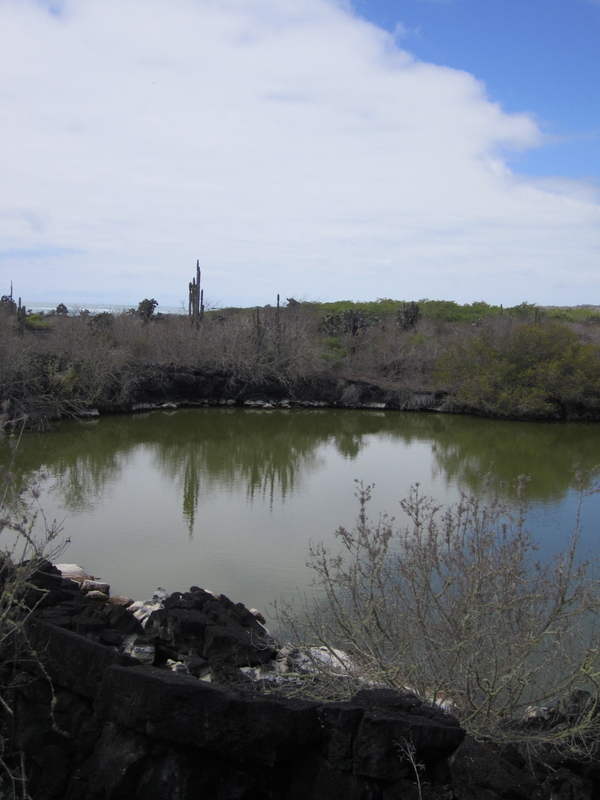 These breeding centers are very important for the survival of the Galapagos Tortoise, as the invasive species on the islands make it all but impossible to sustain their population naturally. They are hoping to one day restore the tortoise populations to what they once were. 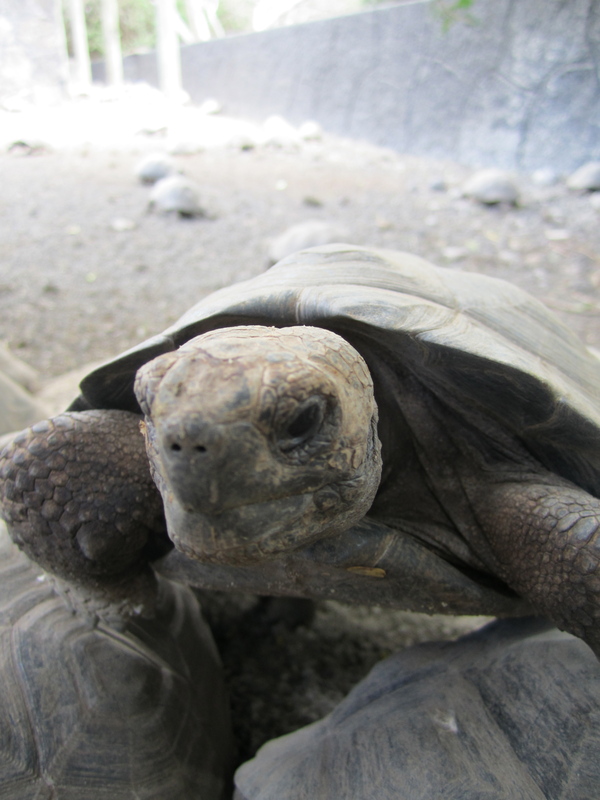 This breeding center has had great success and is currently releasing approximately 100 tortoises in to the wild each year. We remounted our bikes and continued on our quest to find the elusive flamingo. We had seen a flock flying the evening before, so we knew they had to be around somewhere. A flock of flamingos! Not the most graceful in flight. We passed several ponds which were said to be breeding and feeding areas for these strange birds, but apparently they didn’t get the message. 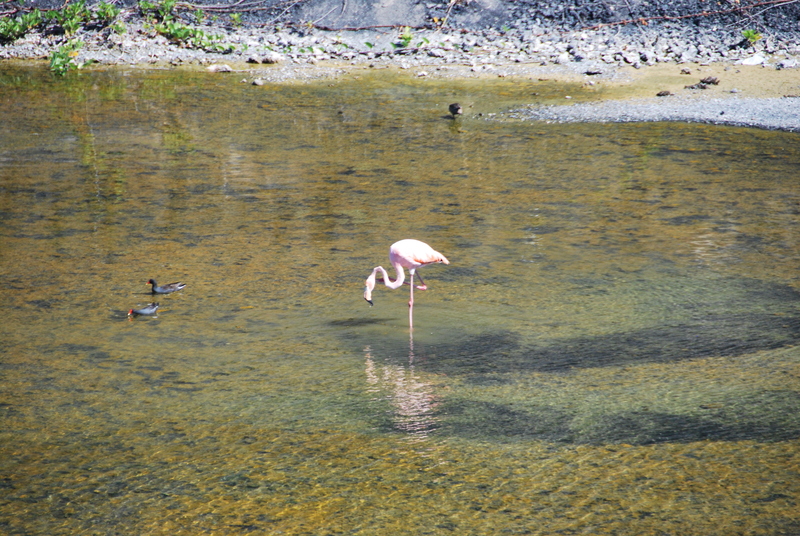 In place of these pink birds, we found a few more marine iguanas to watch. These were some of the biggest ones we’ve seen! They looked like little dinosaurs. If you can’t tell this guy was so terrified of me, he probably moved about two inches. Most of the animals here don’t really seem to care about the people around them. We rode a little farther down the road to were an old penal colony was once located. Not really too much to see here except for “The Wall of Tears” that the prisoners had to build as their punishment. Judging by the wall size, it looks like a lot of “punishment” was doled out. 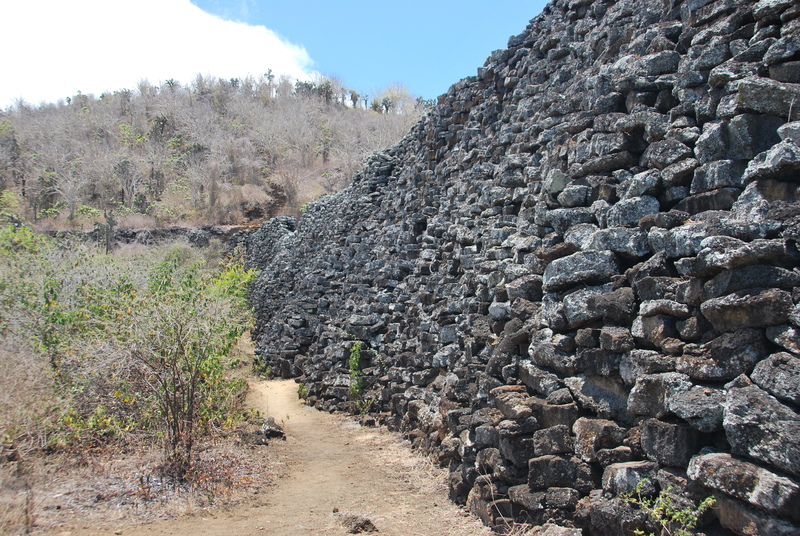 It turns out that the wall has now become a giant wasp nest, so we didn’t stay too long… just long enough for Kristen to get stung. 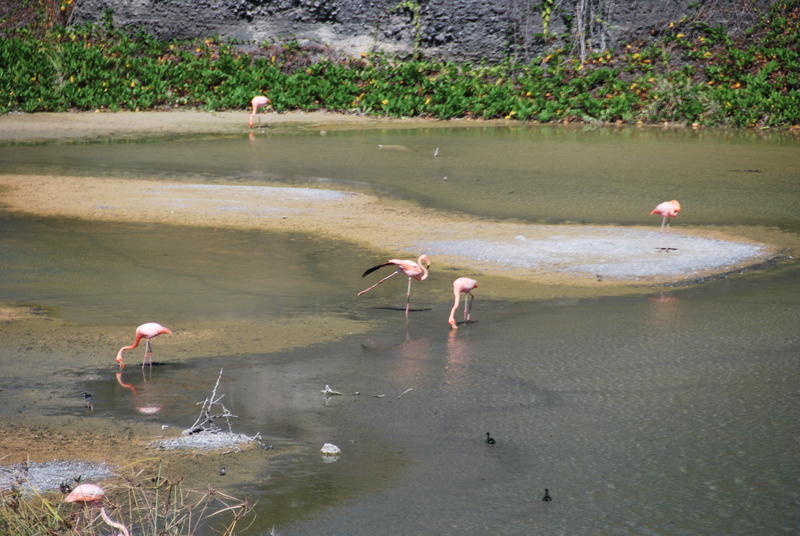 The great flamingo hunt of 2011 was a bust, but we enjoyed our bike ride anyway. It was good for us to get some “off-road” bicycle practice for any fun rides that we might do when Teresa comes to visit. 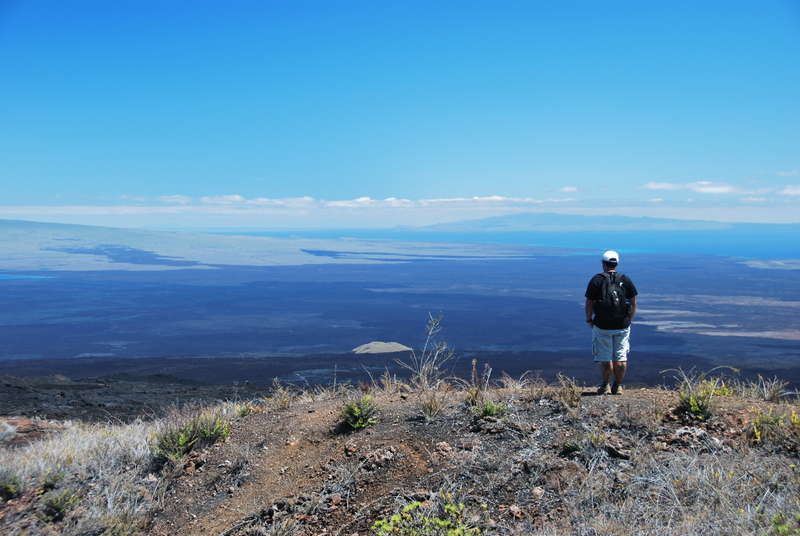 The next day, we decided to check out one of the volcanoes on the island. 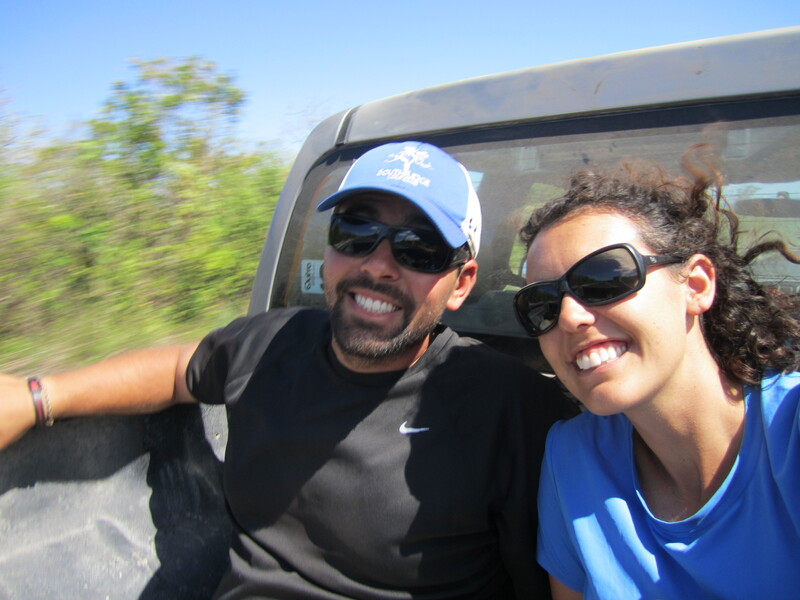 We climbed aboard a truck and whizzed out of the town at death-defying speeds. Guess Darwin forgot to put up speed limit signs, or maybe this is how evolution works? 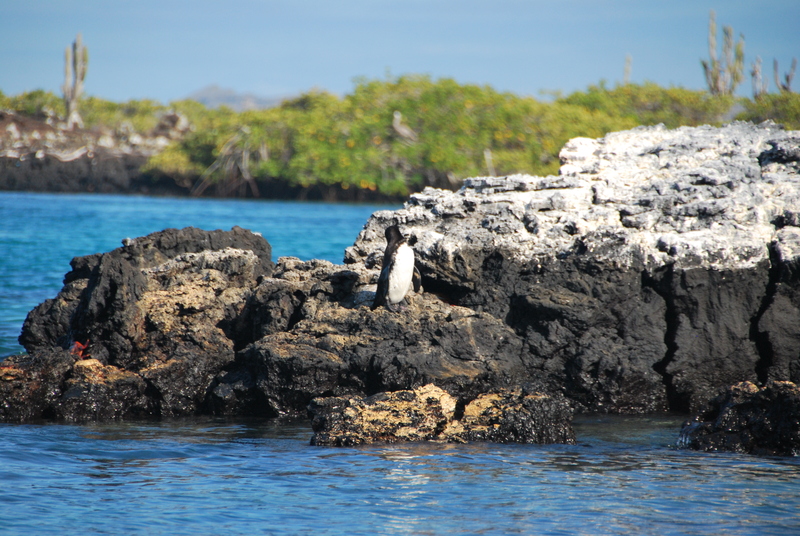 It turns out the Galapagos have more to offer than just interesting animals, as the geology here is quite amazing because these islands are relatively young. 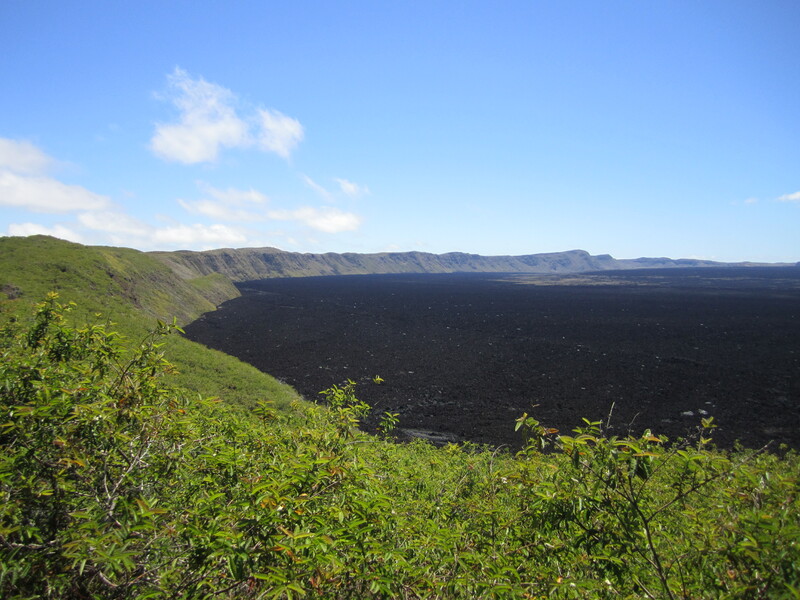 Sierra Negra is a fairly active volcano that last erupted in 2005, when its crater was filled with up to 10 meters of molten lava. They say this is the second largest active crater in the world (supposedly after Yellowstone), but we have not fact checked that one yet. We lucked out and the weather was great during our hike. 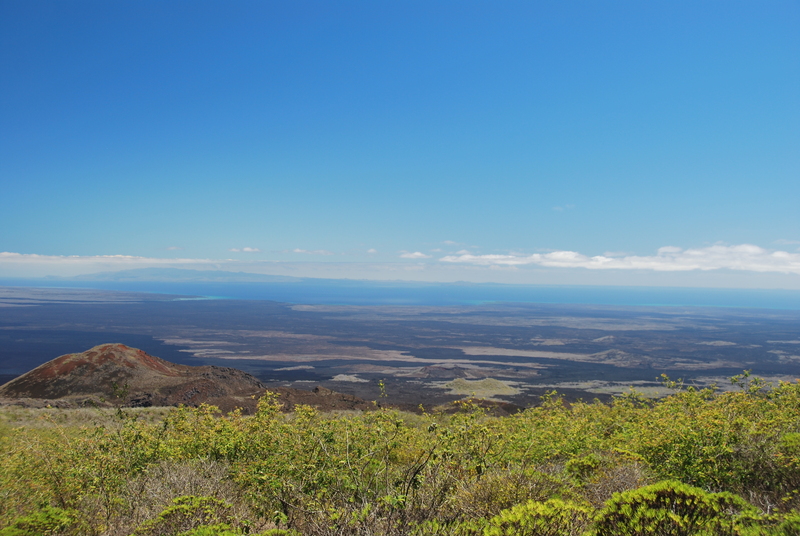 The views in all directions were killer and we could see many of the other Galapagos islands on the climb. Being gluttons for punishment, we continued hiking over an area reminiscent of the moon to Volcano Chico. 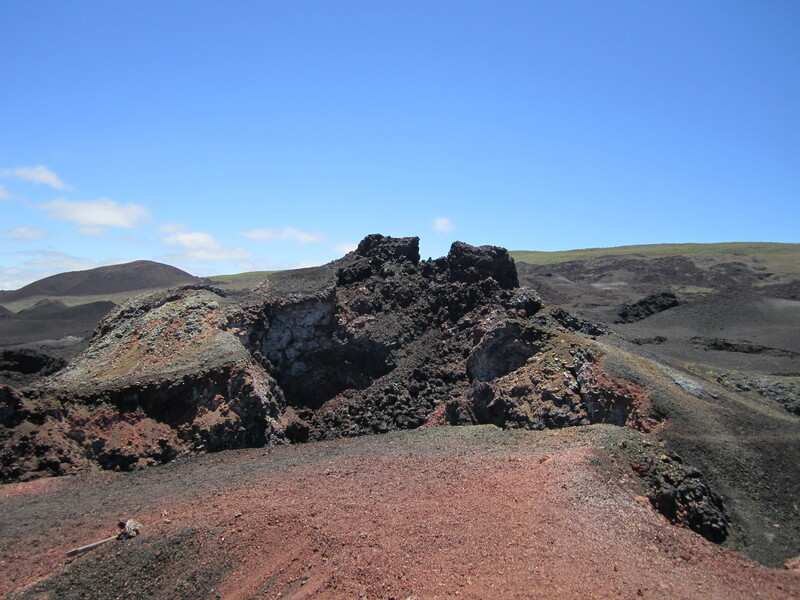 This area of the island is very arid (aka: no shade), but luckily there was a decent enough breeze to cool us down. The landscape is barren but strangely beautiful. This part was last active around 1979, so I guess you can say we are almost as old as dirt, well in this area at least. Finished with our geological tour, we hopped back into the trucks and headed down towards the coast. Just when we least expected it, we made our greatest discovery… flamingos. 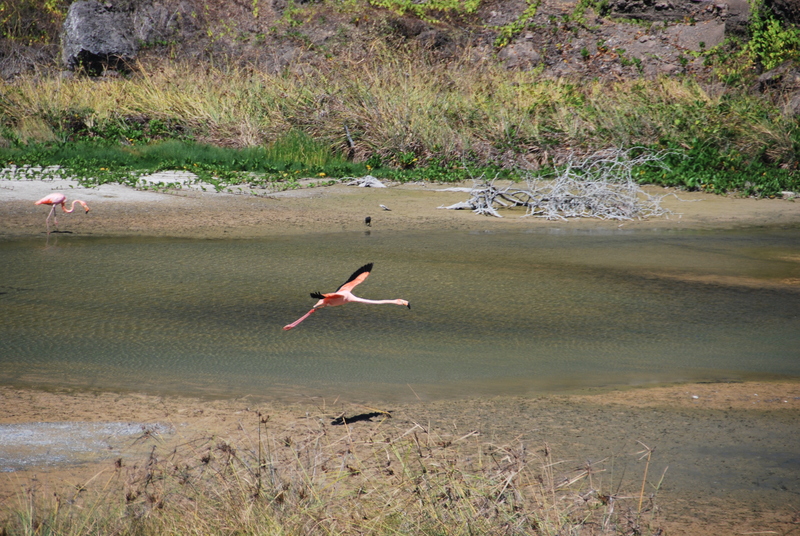 We have been on the constant lookout for these pink birds after that first amazing fly by. Who knew they would prefer the local rock quarry to the ponds that are provided for their protection? 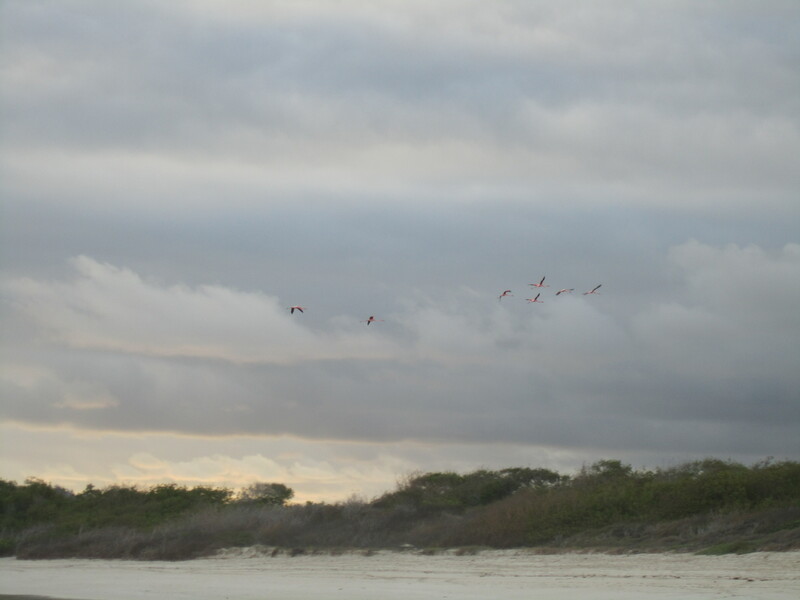 Luckily our guides did, and they made sure to give us a peek at this colony of flamingos. We pretty much could have ended our trip at this point and flown home happy, but we wanted to go snorkeling again. 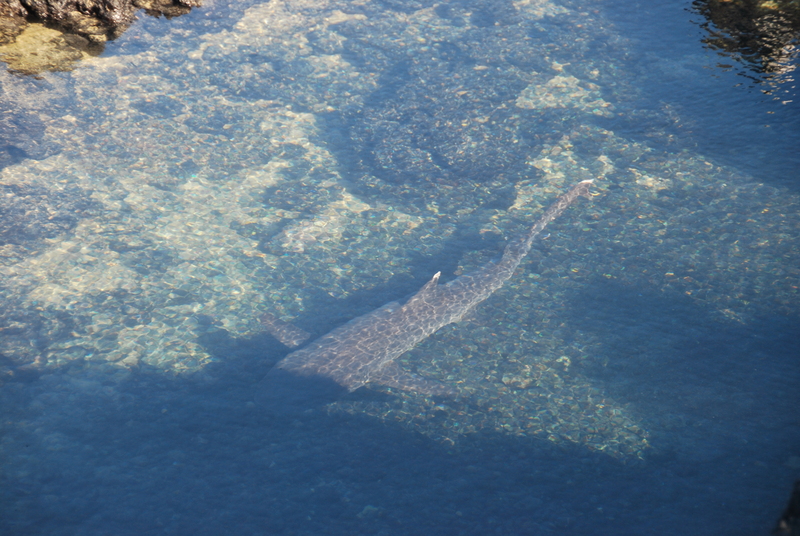 Just next to the town harbor, there is a great place to snorkel and see a lot of wildlife called Concha y Perla. 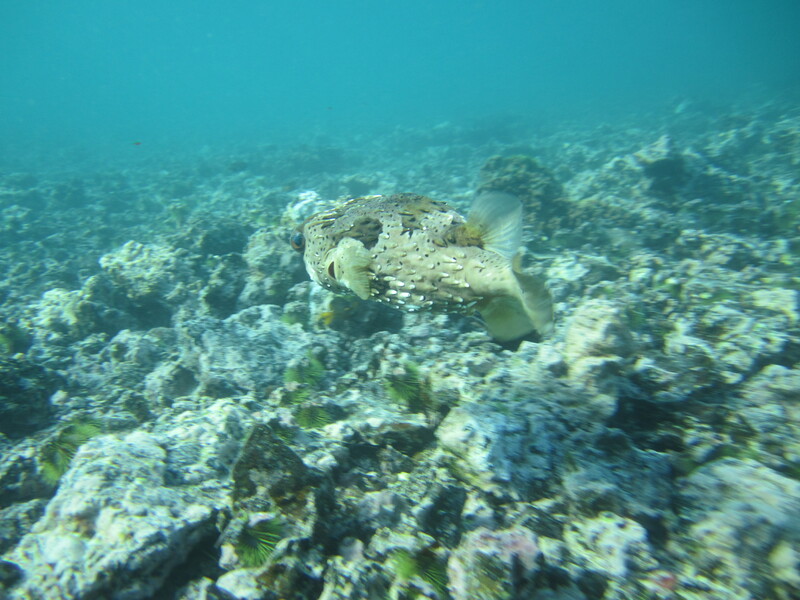 At first we weren’t too impressed with the snorkeling that everyone had RAVED about. 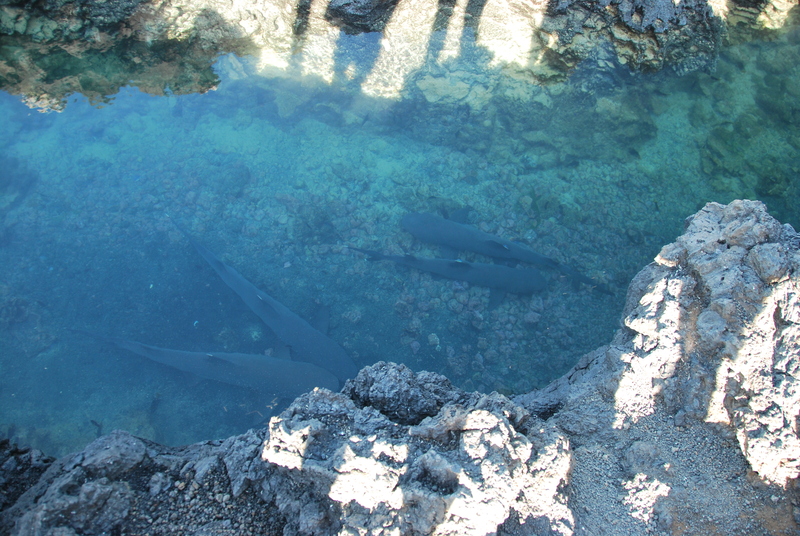 Then we realized that we were really supposed to go to the outer pond to snorkel. How do you get to the outer pond, you ask? 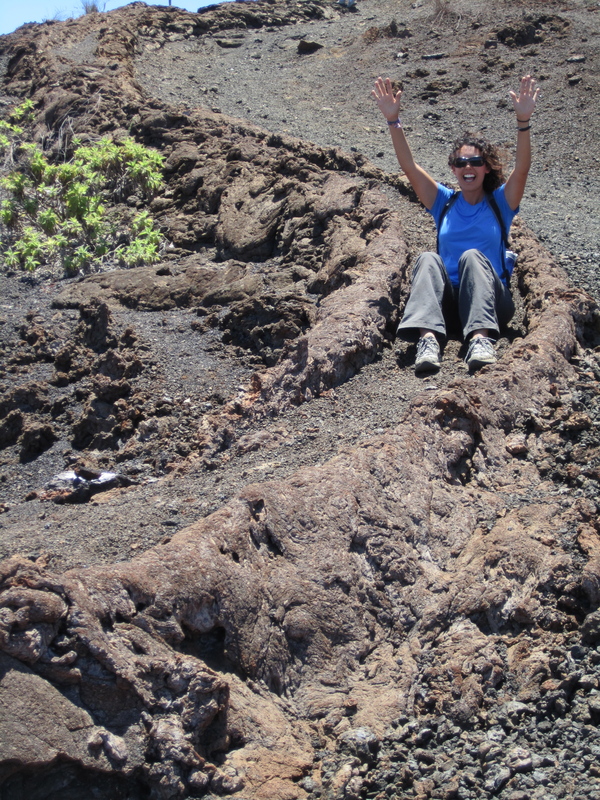 Oh, simply by walking over a bunch of lava rocks… in flippers. We really should have gotten pictures of this “2 Stooges” routine. Once across, and with just a smidge of our dignity intact, the snorkeling turned out to be just as amazing as everyone said. Joe swam over him just to gauge the size. 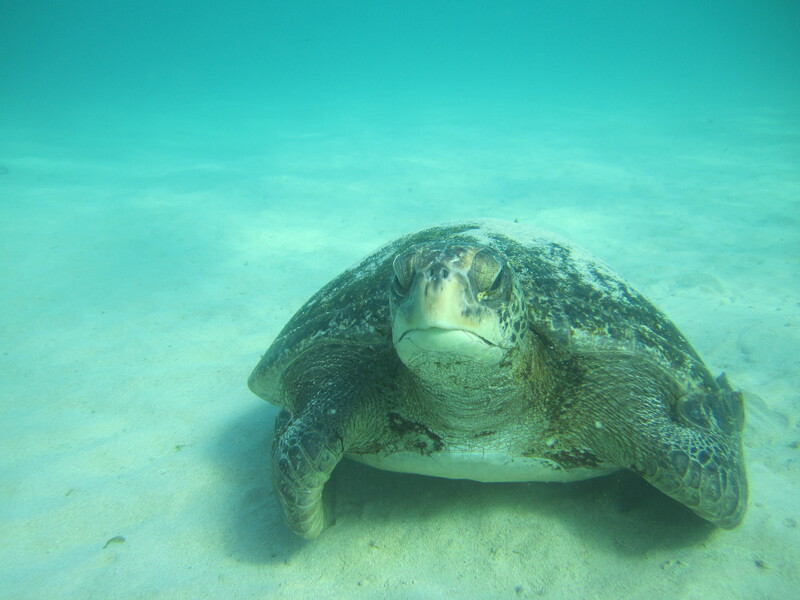 Again we found some sea turtles. For some reason, instead of swimming around, they liked this area to sit on the sand and just relax. 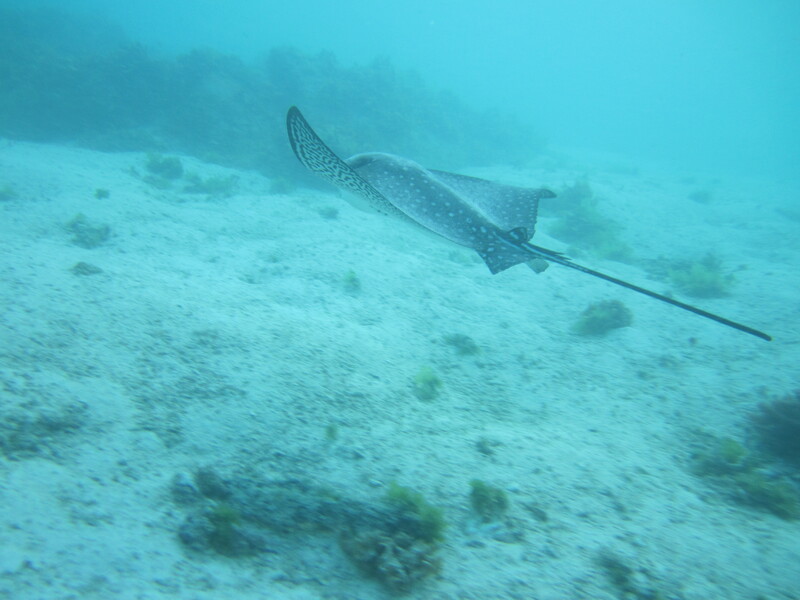 The wildlife was nice, and this time we didn’t see any sharks, so we swam a little easier. The final day on Isabela we took a short boat ride to Las Tintoreras, which is named after the white tip reef shark that likes to rest there. 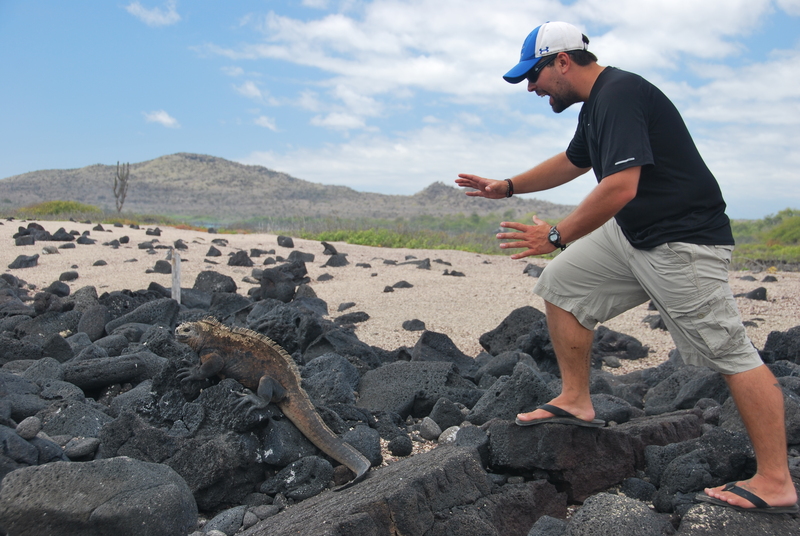 In addition to the sharks, the island is also a great place for marine iguanas, sea lions, and penguins. We only saw two penguins, and it was from a distance, but they were so cute that we wanted to bring one home with us. Luckily for the penguin, we don’t have room in our bags. 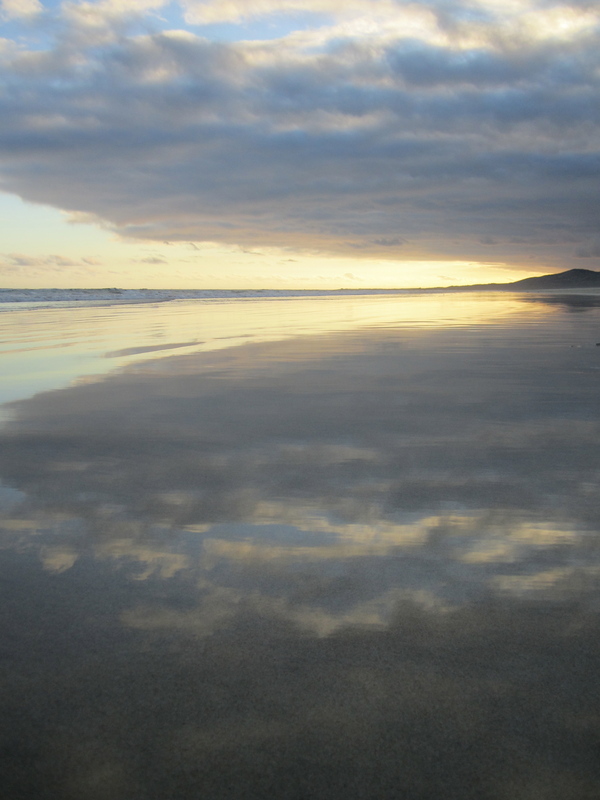 The trip to Tintoreras was finalized by a quick snorkel before sunset. Wait, isn’t that when the guide said the sharks wake up to feed?!? 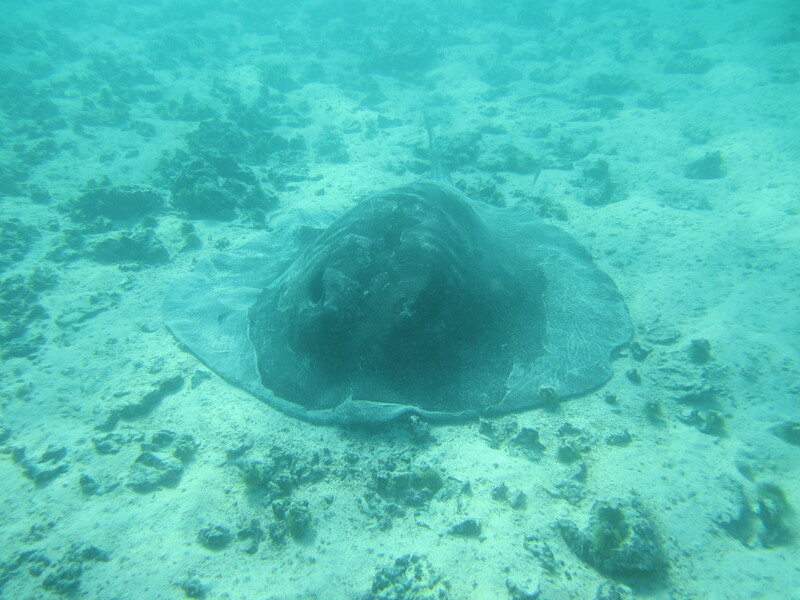 Well, no sharks were encountered, but we did see a few more turtles, eagle rays, sea lions, and a few other fish. 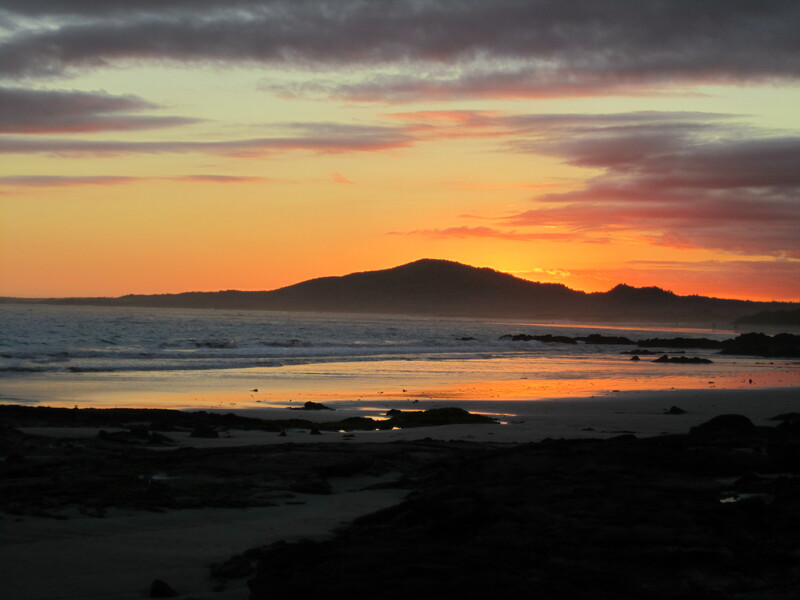 We finished our time on this island with an amazing sunset on our favorite beach. Isabela definitely did not lack in amazing sunsets. Two islands down, only one more to explore! These photos are incredible! I want to go! Loved the flying “mingo”. Glad to see you weren’t actually swimming with the sharks this time. Are you guys going to be able to adjust to life when you return to the real world? Keep writing and taking pictures! I am loving it. I can’t believe how irritated that tortoise looked! Sheesh. And that school of tortoise kids needs to slow down; they were playing recklessly fast! 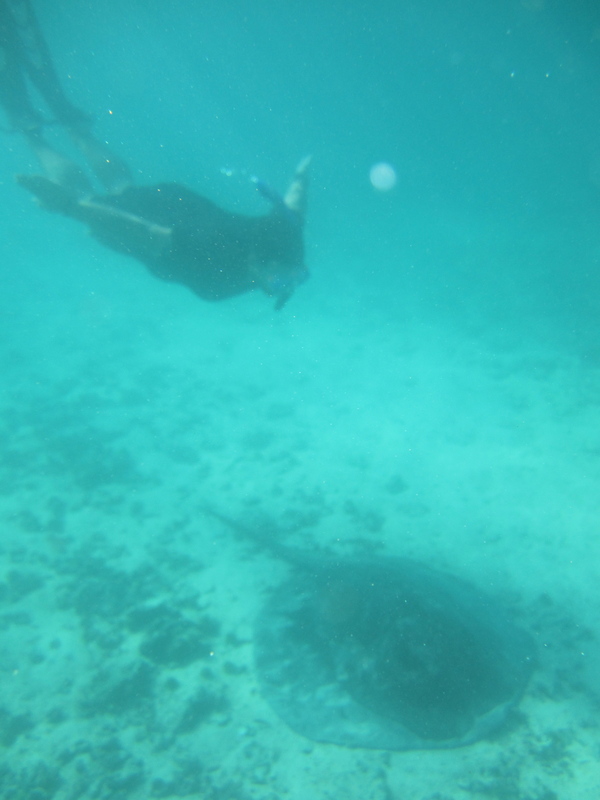 Seeing Joe near that sting ray made me remember how good he is at dipping down into the water; I was impressed in Hawaii how he swam like a dolphin, and the memories came flooding back. Though I don’t know how he would match up against some of the marine life in a contest.